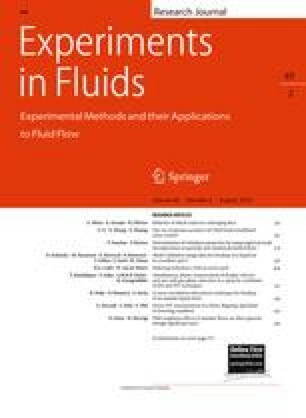 A novel experimental technique for studying the stability of the breakup of a two-phase flow is presented. High-speed backlit photography is used to capture realisations of the unstable mixing layer, and the edge velocity is derived in order to measure the effects of parameters such as gas/liquid momentum ratio, Reynolds and Weber Number. This has traditionally been an edge detection problem that introduces additional uncertainty. Here, a cross-correlation solution is presented, which overcomes the limitations of threshold techniques. Practical application is demonstrated for an atomising annular liquid sheet under several conditions. Sensitivity due to edge blurring and noise is quantified by artificial analysis. Sensitivity analysis shows accuracy and precision to permit sub-pixel precise velocity and stability measurements up to 0.6 sheet thicknesses from the nozzle exit at the conditions studied. D. Duke was supported by an Australian Postgraduate Award whilst undertaking this research.